The Food and Nutrition department at Northwest Hospital prepares great tasting, nourishing and well-balanced meals that are ordered by your physician. 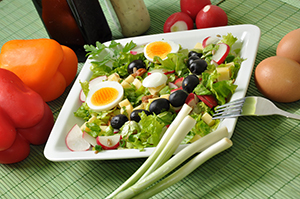 A clinical dietitian will assist the physician in making sure your diet is specific to your needs. All of our meals are fresh and made throughout the day. When we receive a diet order, a menu appropriate for your diet will be delivered to your room. Family members can place your order from home by calling 410-601-5725. Your physician can order kosher meals upon request. Guest meals are available for $8.00 if your family or friends wish to dine with you at your bedside. Please check with your host or hostess to order guest meals. Guest meals will be charged via iPad credit card payment. The clinical dietitians at Northwest Hospital are members of the health care team who care for your nutrition needs. The dietitians are available to answer questions, provide personalized diet consultations (24-hour notice required) and/or speak to you about outpatient nutrition services after discharge.